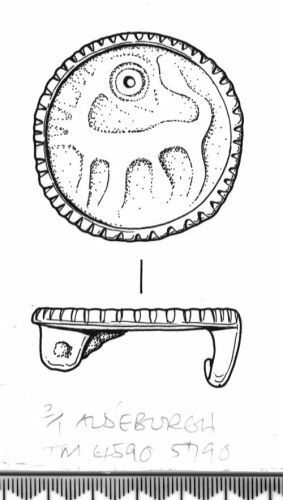 Flat circular brooch, 23.5 mm in diameter, decorated with a relief animal with its head turned to look backwards. The animal is now rather worn and blurred but has four legs, a tail and a long neck ending in a head with an enormous ring-and-dot eye. There is a raised border with transverse nicks. On the reverse is a double pin bar lug, with remains of the iron pin bar and iron spring, and a transverse lug with hole and slot forming a catchplate. 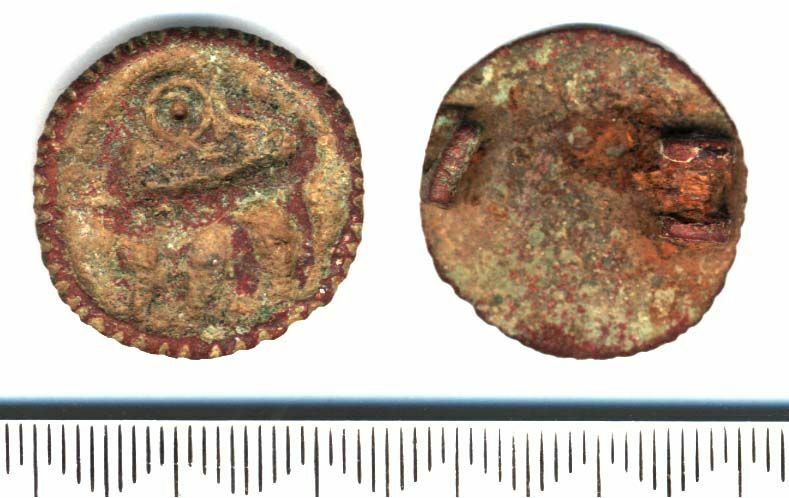 A similar backward-looking animal brooch found in an early 10th-century context in 16-22 Coppergate, York, gives the best archaeological date for the series (Roesdahl 1981: 75, 105). Included in Weetch 2013 as catalogue no. 89.